Getting ready for the 2014 Travelers Championship here in a few days. One of my favorite times of the year. 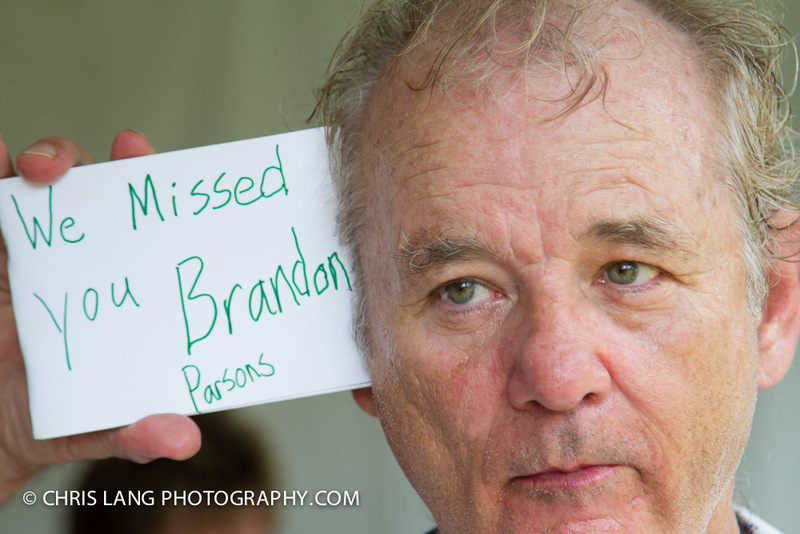 I have been meaning to share this one since 2012 about Bill Murray at the Celebrity Pro Am. I start with, this is written from my perspective and mostly personal account. It is from a perspective of a tournament photographer and not a journalist. It is also to share some personal experiences of a photographer behind the scenes and intended for those who enjoy the working field of photography. So it was a treat to be close to one of the actors you grew up with and always enjoyed. Some of my fave movies are “What about Bob,” “Rushmore,” and “Stripes.”. On Celeb pro-am day, you never know what to expect when you see the celeb’s exit from the clubhouse onto the first tee box. 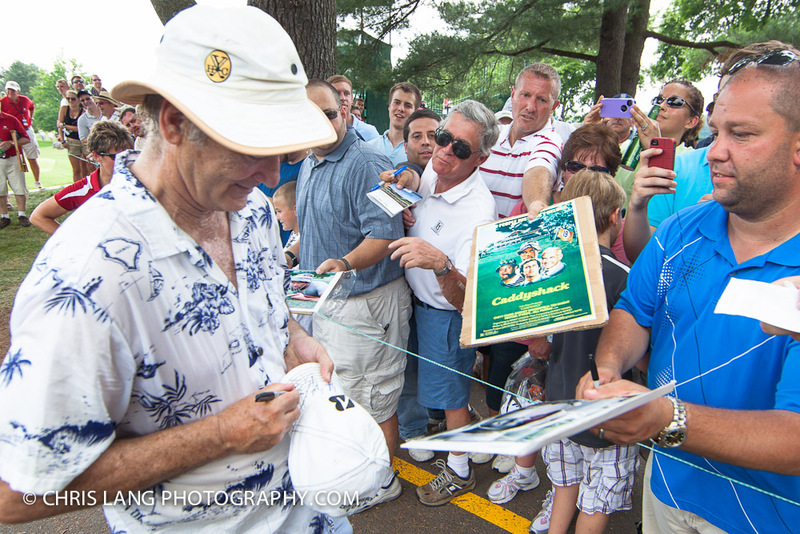 This year, there was a lot of anticipation of Bill Murray coming out for tee time. What added to the excitement was that he was an iconic character in one of the most classic golf movies ever made. This was substantiated by all the Caddy Shack memorabilia on the course. As the crowd gathered around the 1st tee, you could see people waiting in anticipation hoping to get their “Bill memorabilia” signed. All of a sudden, you could hear the crowd go wild and all the “Caddy Shack” one liners being tossed out as he walked by. When Bill got onto the 1st tee box, he was mobbed. I mean mobbed by the media. There was not much in the way of a safe place from a camera. Media came out of the woodwork. Not a typical setting on the 1st tee as it is always run with tight structure. Even though it was my job to photograph Bill with the media interaction, I actually felt for him as he could not turn with out getting a TV camera and microphone in his face. This is that delicate time of when to build trust among the people inside the ropes but also understand that you have a job to do. There is a on and off time. There is a time to shoot and time when not to. After years behind the scenes, you have to earn the respect of the people who hire you and build a trust among the people you will be around. I have learned that players will put their guard down and engage you when they know you are not snapping all the time. I took a few shots that I needed to give the tournament for the 1st tee. My intent was to get Bill later in the tournament when things settled down a bit. One of the things about this celebrity Pro Am day was that it was HOT. I mean HOT. Like Africa HOT. (Yes, I have been there). People were getting wiped out even before the play was happening. I actually observed a lady pass out in the stands in front of me and it was not even 1pm yet. It was crazy hot! The golfer’s shorts were drenched and they did not even tee off yet. 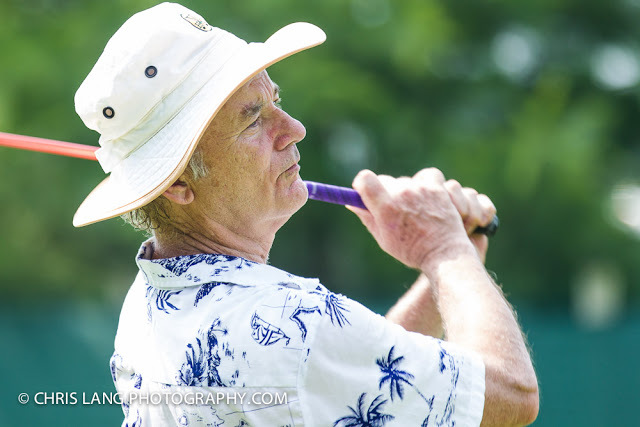 So after we got the group shots and the players tee’d off on one, the mass of people headed down the fairway following Bill Murray’s group that included PGA player JB Holmes, Amhad Rashad,and Coach Scott Burrell. I know my plan was to get Bill and his group at the 9th where I have nicknamed it the “gauntlet”. This is where fans can line up on either sides of ropes where the players have to walk through the fans to get across the road to the 10th. 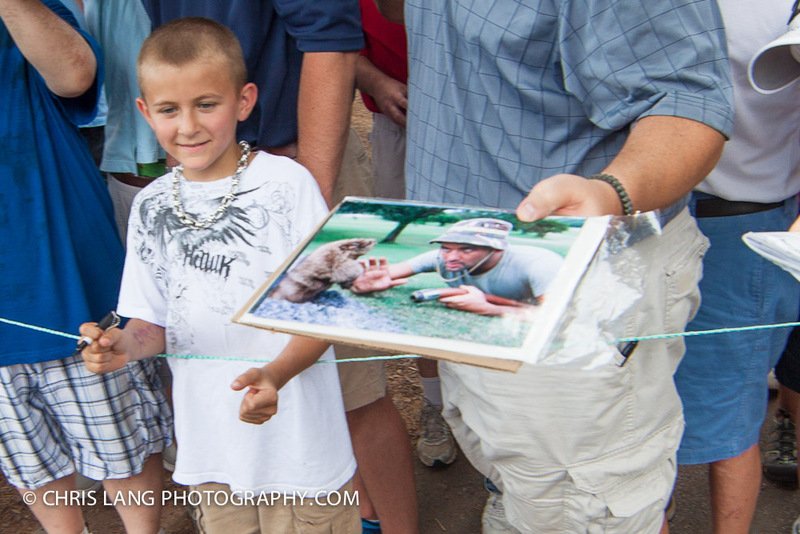 One of the best autograph opportunities on the course for sure. As Bill and his group approached the ninth green, it looked like they just jumped into a pool with all their clothes on. They were wiped and soaked. Part of my job on this day was capturing the crowd’s experience and their interaction with the celebrities so I stay in the middle of the ropes which puts me next to the celebs and golfers making for a great vantage point to capture the interactions. This is also where the professional memorabilia people come to get memorabilia signed. The players and celebs will often pass on signing certain products as I am sure they know it will just be up for auction somewhere down the line. I saw everything from Caddy Shack posters to an actual Mr. Stay Puff from Ghost Busters. As Mr. Murray walked through signing autographs, a man yelling loudly really stood out from all men, women, kids, humanity trying to get Bill Murray’s attention. All you could hear is “Bill, Bill, Mr. Murray, Bill. It’s in the hole, Bill…”. You get the point. Amongst all the chatter, all you could hear was the man who was screaming “BILL SIGN MY HAT.” Bill stopped, looked back and went back to the guy. He looked at him, looked his hat and then took it from him. When it looked like he was about to sign the mans Bronco hat, Bill turned and threw it as high as he could into a tree and yelled “I hate the Broncos.” The crowd erupted in laughter as the man’s hat hung in the branches. Now I do not think Bill hates the Broncos, however the crowd, Patriots fans no doubt, were vindicated and it made for a “Bill Murray Moment”. The 10th provides some shade as there is a players tent and no public can get near so it is a good rest point for the players. The golfers went into the tent to get a break from the sun and get something to drink. I knew Mr. Murray was tired and had been pummeled by the media and the fans so I holstered my cameras and just hung out. During this moment of break, JB Holmes (tour player) took his picture with Amahd Rashad. 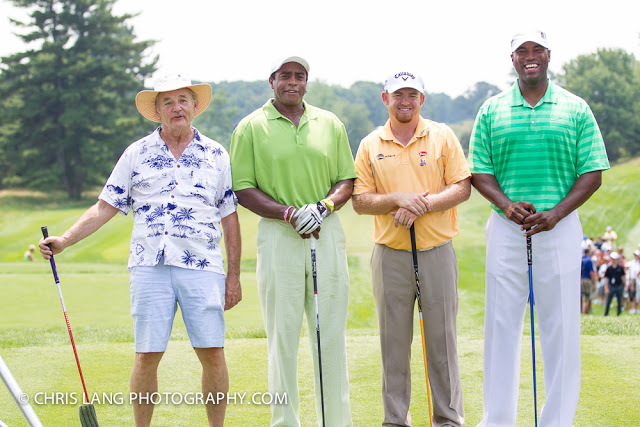 In that moment JB Holmes took out a piece of paper and wrote “I miss you Allan Parsons” and took a picture with Amashd Rashad. Bill came over and asked what they were doing and JB Holmes said he is my caddy and this was the first week he missed in years so he was texting him a picture. Bill took the piece of paper and held it up to his head so he could get another shot. Normally, I would just have taken the shot. This was an off camera moment so I asked him if he minded and he nodded to go ahead. I think they respected that and continued having some off-camera humor. The only other picture I took at 10 was when Bill, drenching wet, went and sat on a volunteers’ lap for a minute. 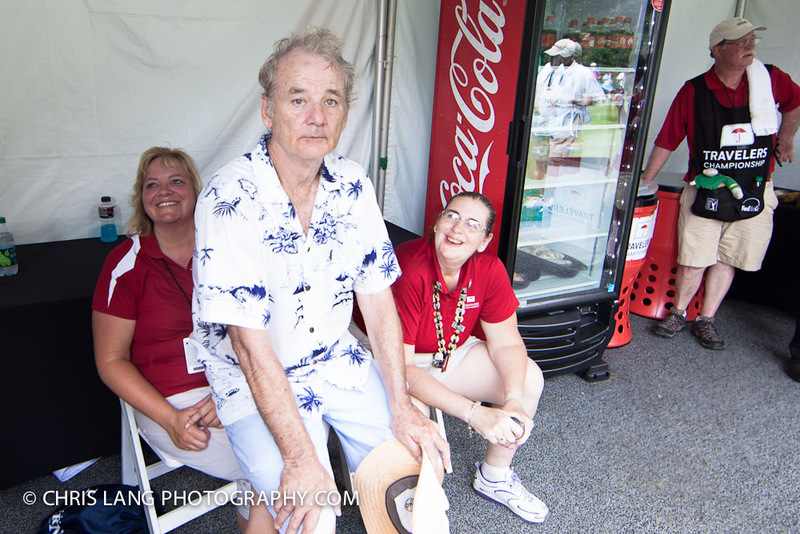 The girl did not know what to do and was laughing, perplexed, and trying to figure out why Bill Murray was siting on her lap. This was out of view of the public and I thought it was pretty cool that he took a moment to make one persons’s day. You often hear about the non-scripted stories of people’s encounters with Bill Murray and the kindness and humility he has when cameras are not around. I am not sure if anyone has written about this or even known the story of what happened later that day. As mentioned before, this was a HOT day. People passing out all over the course and even Geno Auriemma, the legendary basketball coach of UCONN, had a brief moment of heat exhaustion and went down on the course. At the end of Bill’s round his caddy passed out in the parking lot. You have to imagine the scene and understand that everyone was wiped out. The Medical trailer looked like a MASH unit. There must have been over 30 people getting IV’s on gurneys. So here is Bill Murray after a long exhausting day of not only playing golf in wicked heat, but also engaging and entertaining fans all day now in the parking lot with his caddy passed out. No fans, no media, not much in the way of anyone around and now his caddy, who he probably never met before the day, now laying in the parking lot. Medical attention arrives and they get to the tour player tent to get medical. Bill stayed with his caddy for 2 plus hours until the caddy was finally brought to the hospital. I was told that he checked up later on his caddy later that evening. After hearing that side of the story, I have gained even more appreciation and respect for Bill Murray. From the outside looking in, it may not seem like a big deal to the everyday person, however, if you saw how spent everyone was from the golfers to the public, it takes a genuine thoughtfulness to see outside yourself and look out for someone else. 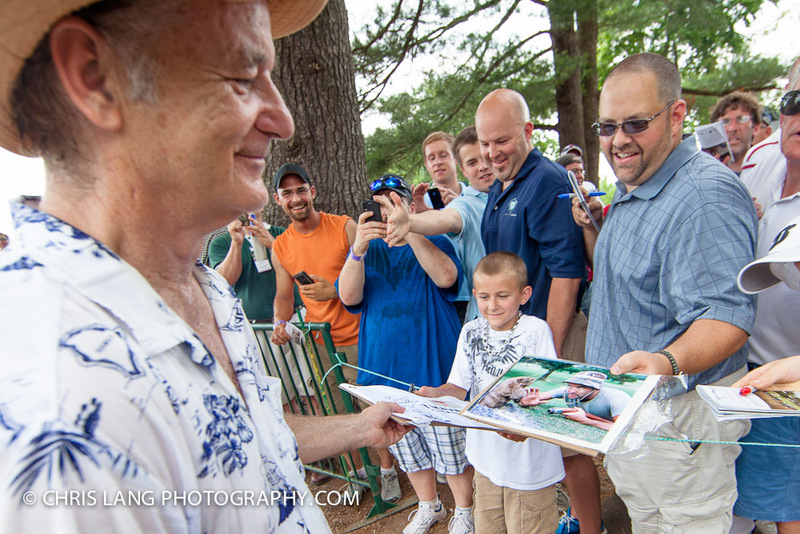 In my book, that speaks to the character of people and Bill Murray showed just a little of his to a small group of people that day. There were no media cameras around, no one to publish a story…just a class act. Hope he comes back.